Sepetmber 30th is a day to capture your ideas. Sun conjoins Mercury (retrograde). But, Sun/Mercury quincunx Neptune leads to confusion in areas of communication and transportation. You may not be able to act on them, but do capture those creative ideas. Review them after October 9th and see which ones are worth your efforts. This problem with the quincunx affects October 1st as well. What follows the Blood Moon will be a two week period of “clearing out” what needs to be gone. This is a time to clear out old patterns and people to make room for new growth starting with the next new moon. While this is true for every period following a full moon, the patterns and signs indicate that this is a time for Big Shifts. And, since the Sun will soon enter the Via Combusta, for some this clearing out period may take a few weeks longer, into the first half of Scorpio. That marks Samhain (the astrological version of Samhain, the November 7/8th original version) as the turning point for some. The Larger Context: Thursday, September 17th has arrived and now passed, Jupiter opposite Neptune has perfected, and Mercury has stationed Retrograde. Dreams and dreaming become important at this time. Keep a journal if you can and pay attention to the messages that are coming to you. They may provide a glimpse of your future that you cannot see any other way. And, one day, you may look back upon your writings as being particularly important. If we see any issues from this eclipse, we suspect that they will deal with decisions that involve higher order aspects (a 5th Harmonic pattern and a 7th Harmonic pattern). A decision appears to be present: whether to stick with tradition (Vesta, doing things the way we have always done them) or taking a risk (Ceres, feast or famine). Some people will end a relationship at this time (Ceres, the risk of feast or famine) while others will continue with what they know despite some dissatisfaction (Vesta, sticking with what we know). If you do want out, really want out, then your window of opportunity is in the next two weeks (between perfection of the eclipse and the perfection of the upcoming new moon). If you have been tempted lately, we hope you avoided making the wrong decision. For some people, “things” may come to a crisis point in a relationship regarding issues of trust and betrayal. 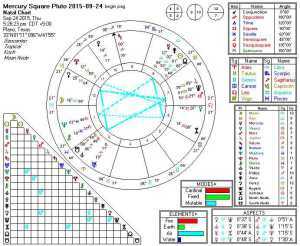 Sun conjoins Juno in Libra on September 26th. Issues of trust and betrayal become critically important in all relationships. Betrayals may result in legal action, and tempers are still running high from the events of Thursday and Friday for some. All of this sets the stage for the power of the influence of the “blood moon” eclipse on Sunday. At least in some cases, be ready for a showdown! 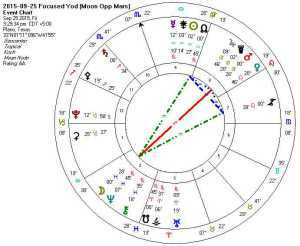 We see a focused yod covering most of the day on September 25th of 2015, starting with the Moon v/c in Aquarius and culminating with the perfection of Moon opposite Mars, Moon in Pisces and Mars in Virgo. The Virgo / Pisces theme that we have seen for most of the month of September effectively culminates here before we face the “Blood Moon” of September 27th. With that eclipse, we will more clearly move into Aries / Libra issues. Thursday, September 24th and Friday September 25th: Watch Those Tempers! Thursday, September 24th brings us Pluto station Direct after Mars enters Virgo and Moon opposes Venus. 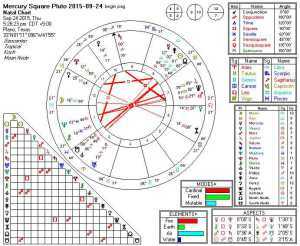 Earlier on that same day, Mercury (retrograde) squares Pluto (direct?). With that, we feel a need to move certain things forward, and tempers may flare on exactly the right way to do that. Just when you thought things could not get worse, a Focused Yod that perfects with Moon opposite Mars dominates Friday. Later on Friday, Mars squares Saturn, something some of us have felt all week. If we missed Thursday’s message to move certain things forward, then we will find Friday’s message hard to miss. As is true with so many of these patterns, watch your temper and focus your efforts and you might surprise yourself with how much you can get done. Capricorn and Virgo “feel” this most strongly, but so does Taurus. Sagittarians will wonder why their world has been “shaken up” a bit (unless they read this blog). All mutables (Gemini, Virgo, Sagittarius, and Pisces) will also tend to feel this. Most of the fixed signs (except Taurus, the rest being Leo, Scorpio, and Aquarius) will tend to watch in amazement (and maybe amusement) unless some Capricorn, Taurus or mutable hijacks them into being involved in a drama they would rather avoid. Cardinal signs other than Capricorn (Aries, Cancer, Libra) will also try to stay out of the drama but may not be able to resist the lure of the power politics at play. Much is happening over the course of these few days up to, and including, the final “Blood Moon Eclipse” in this series.